Even though a user participates with several comments on a post, the system will only count one participation for that user. If a participant uses several comments to mention friends it will count as only one participation but the system will count all the mentions from the user. If a participant uses several comments to add hashtags it will count as only one participation but the system will count all the hashtags from the user. You can add users that use bad practices to your blacklist and exclude them all with one click from any sweepstakes or contest without needing to find them one by one. Your blacklist is associated to your Easypromos account so you will always have the blacklist available. This option allows you to avoid that the same user can win more than one of your sweepstakes. This option is available when there are hashtags in the comments, for example when you have used the tool to filter the comments with a hashtag. This option allows to indicate the end date of the sweepstakes so that users who participated after that date don’t enter in the final draw. This way we guarantee a fair draw. 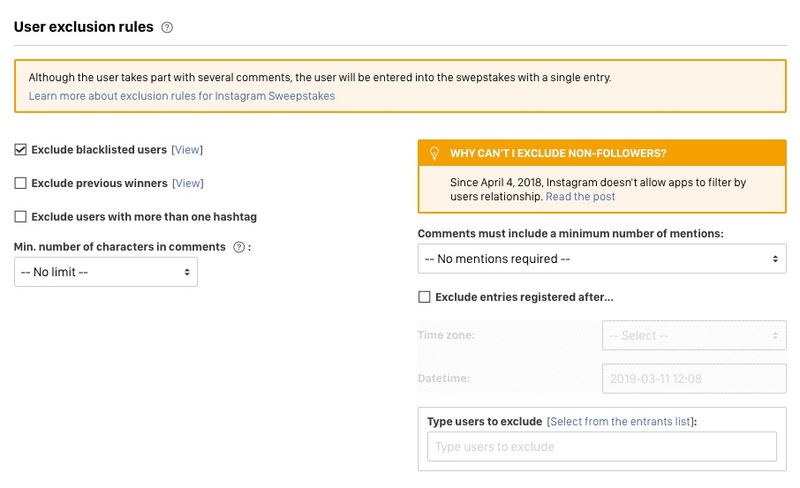 If it is a sweepstakes among users who have commented on several publications, this option allows you to limit the sweepstakes to users who have commented on a minimum number of posts. We explain more about this option here. This allows to establish as a requirement that the users should include one or several mentions in the comment, so that the system will exclude the users that don’t have included the minimum number of required mentions from the final draw (5 mentions maximum). Tip: Take advantage of this feature so ask the users to mention at least 3 of their friends in their comment, and only if they do this they will enter into the draw for the prize. They can mention as many friends as they want and this increases the viral reach and the engagement of your sweepstakes. If you want to exclude a user because he or she doesn’t comply with the regulations, you can use the search field to find that user and exclude manually, or you can do it from the entries list. You can ask the users to include hashtags in their comment to participate. The system will show you all the used hashtags and you can pass the users who have used one or more of the hashtags to the final prize draw. This can be a good idea in promotions that include predictions. For example: Comment this post and tell us with a hashtag who you think will win the oscar for best director: #spielberg #cameron #scorsese #tarantino.